An image compression tool that’s so good, you’ll wish it could take photos, too! With digital SLRs growing in popularity and compact cameras delivering larger image sizes, hard drives around the world are filling up with our photographic memories. File compression is one solution, of course, but it's a big negative when you're after the very best in image quality, especially with so-called "destructive" formats such as JPEG that degrade in quality the more you alter the files. BluBox seeks to address the problem by compressing files down to just a few hundred kilobytes with no loss of quality, and has the ability to expand them again to their original size. It's a great idea and anyone who uploads images to photo-sharing sites will love it. It also makes uploading to Flickr, for example, much quicker because you can upload high-quality JPEGs at a fraction of their original size. Getting compressed images back to their original size was quick and there were no adverse affects in quality. It's a great tool that's so quick and easy to operate. You can employ BluBox to archive huge volumes of images and this is another failsafe if you're looking at good back-up options. Protecting archives with passwords is easy and the actual images are encrypted with 256-bit AES security. 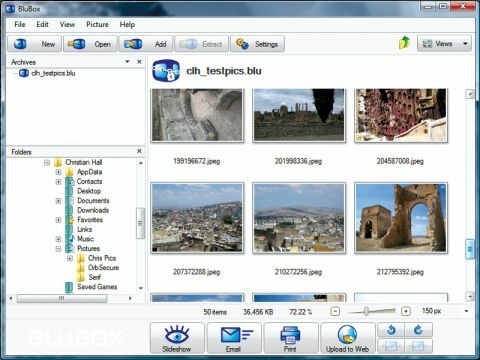 Unlike many compression tools - or uploaders for that matter - BluBox enables you to view pictures in full screen while they're encrypted and compressed. You don't need a separate photo organiser because BluBox does a great job of offering the types of features found in more costly programs such as Serif's AlbumPlus. There's also the BluBox Viewer, which is available as a free download from the Web site. This enables you to send archives to your friends and family, who can then unzip your archives and view a substantial number of images in just one email. Whether it's a photo-sharing site or email, BluBox is a speedy solution to cutting down file sizes and at £20 you can't go wrong. This one comes highly recommended.